Cattle and Retail Beef Cuts Available at Greier Ag Center, Inc.
to keep a healthy herd. We never use or feed antibiotics, animal by-products, growth hormones or growth stimulants. Our goal is to produce top quality, all natural beef for you and your family. 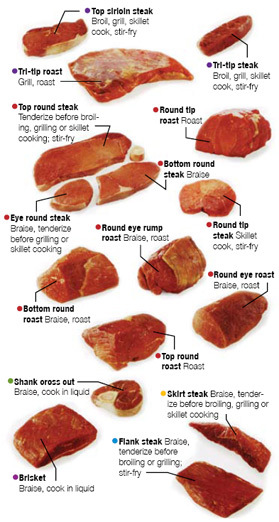 The photos below are of retail beef cuts; the color coding refers to the diagram. 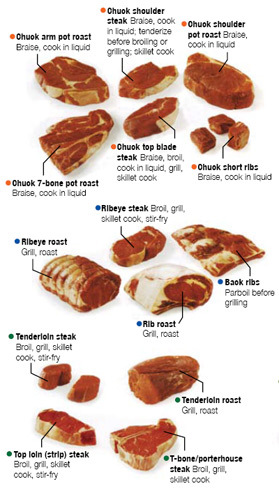 The best ways to cook each cut are also listed. There are several ordering options available for freezer beef. You can purchase a whole beef, a half of a beef or even a quarter of a beef. Cost includes the beef, delivery to processing center, all processing fees and government regulated beef check off fees.